A Philadelphia police officer holds a package of the overdose antidote naloxone while on patrol in the Kensington neighborhood of Philadelphia in April 2017. More than 1,200 people in Philadelphia died of drug overdoses last year, the vast majority of them due to opioids. The department of public health there has a clear message to residents - carry naloxone. It's an overdose reversal drug that's easy to get. Allison Herens works for the city's public health department. It trains residents to get comfortable with administering the drug if they see a potential overdose. ALLISON HERENS: We really say the naloxone is as harmless as water. You know, we really encourage you to give it, even if you don't know what the person took. KING: Nina Feldman covers the opioid epidemic from member station WHYY and had a recent experience that made her question if it might be more complicated than that. NINA FELDMAN, BYLINE: It was a really hot afternoon this past July, and I was in Philadelphia's Kensington neighborhood to interview Jasmine Johnson (ph) for a video project. Jasmine's in recovery now, but she lived on the streets of Kensington for six years. I'm going to move you over a little bit. FELDMAN: We met in McPherson Square Park, which used to be known as Needle Park. Since then the city's cleaned it up. When we got there, a group of preschool kids was playing on a Slip'n Slide on a nearby hill. FELDMAN: But it's still a popular spot for people to use drugs. As we were setting up the camera, we saw a couple sit down maybe a hundred feet away and take out some syringes. We watched them inject - he in his arm, she in her neck. She leaned back onto him and relaxed, and we went on with our interview. But after a while, the woman really wasn't looking so good. She was splayed out on top of the man, neck back, mouth open, skin pale. He was checking her pulse. Jasmine went over to see if the woman needed naloxone, also known by its brand name, Narcan. But the man she was with angrily refused it. UNIDENTIFIED PERSON: No. She's not - she don't need Narcan, dude. FELDMAN: Jasmine tried to wake the woman up. It didn't work. But still the man insisted she was fine. UNIDENTIFIED PERSON: Yo. She's breathing. FELDMAN: Jasmine came back over to where we were filming. JOHNSON: He says she's fine. She's just really high. She's fine. JOHNSON: Yup. And they're not just going to let you do it because she's like - she's going to be so mad. FELDMAN: To understand why someone who uses drugs might not want Narcan during a suspected overdose, it's important to understand how the drug works. Narcan is usually given through a nasal spray, and it bumps the heroin or other opiates off the opioid receptors in the brain. That blocks the effects of the drugs - both the euphoria of the high and the slowed breathing that cuts off oxygen to the brain. That's why Narcan saves lives. But in that process, it can also send someone into instant withdrawal. Many people say withdrawal is like having the worst flu of your life - cold sweats, shakes, vomiting. While I knew all this in theory, it just hadn't really registered to me until now that someone would risk death to avoid withdrawal. As Jasmine and I were getting ready to head out, the woman still looked pale and unconscious. I didn't feel right leaving, and Jasmine could tell. JOHNSON: That's all you can do is ask and keep moving. FELDMAN: But was that really all we could do? I just couldn't shake the feeling that the woman might've been overdosing while we just stood there watching. HERENS: So how do you know when to do something? FELDMAN: That's Allison Herens. She's the harm reduction coordinator at Philadelphia's public health department, and she's leading a training about naloxone. She's the one who said earlier that Narcan is as harmless as water. But even she admits it's tricky to know when to use it. HERENS: You know, you see the person who is nodding out, but they'll come back to consciousness, right? But the big thing to keep in mind with that person is, are they breathing? How does their color look? FELDMAN: Herens says if someone has stopped breathing, definitely give them Narcan. But because the effects of withdrawal are so bad, you really want to make sure that they need it. HERENS: If they wake up in full-blown withdrawal, they are not going to the hospital. They just are not. They are going to go run as fast as they can to try to use again. And I know because I've seen it happen. FELDMAN: Jeremiah Laster is a deputy chief at the Philadelphia Fire Department whose EMS workers administered Narcan more than 5,000 times last year. He says it is common for people to be upset when they come to. Because of this, Laster says there are some situations when it's probably better for a civilian to just stand back and wait for professionals to get there. JEREMIAH LASTER: Certainly, if you had somebody that's, you know, 6-foot-4 and was, like, 300 pounds, you want to be very, very careful how you wake that person up. You have to be prepared to protect yourself. 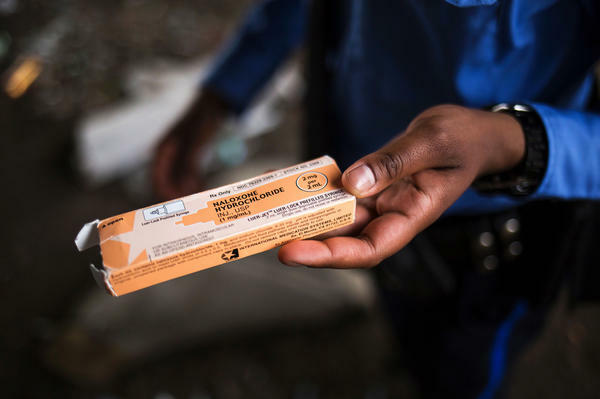 FELDMAN: This advice seems to contradict the city's push for the public to carry Narcan, but Laster and Herens both say it's just about knowing what to expect. One thing everyone agrees on, the first thing to do is call 911. Ultimately, that's what we did. As soon as the woman heard the police were coming with Narcan, she bolted straight upright. She and the man were angry. Their highs had been blown. They got up and left before the police arrived. Herens, who estimates she's given Narcan about seven or eight times, says at the end of the day, someone being irritated is a small price to pay. For NPR News, I'm Nina Feldman in Philadelphia. Transcript provided by NPR, Copyright NPR.